On hearing this, I was stunned at the crassness of the remarks. The cavalier use of the term ‘lifestyle choice’ is totally inappropriate when referring to the people who will be affected by the proposed closures. As WA Opposition spokesperson Ben Wyatt has remarked, the PM’s words suggest that the Aboriginal people affected have made a mere ‘sea change move’. There has been a torrent of criticism aimed at Mr Abbott, among the most incisive coming from Noel Pearson who knows first hand the complexity of bringing about change in remote and disadvantaged communities. He challenges the government to address a number of questions regarding this issue. The Prime Minister refers to ‘full participation’, but his meaning is not clear. Significant numbers of Indigenous people who are not living in remote communities can hardly be said to enjoy full participation; indeed, nor can many non-indigenous urban dwellers. Reliable water and electricity supply, health, education, housing, etc. are services all Australians should expect, wherever they reside; such provision in the communities being targeted, has, for a considerable time, been paid for by the Commonwealth and the State, jointly. That some people stay in remote communities, despite the limitations they encounter, attests to strong and enduring attachments to family and land. There is a degree of attrition as some people move to cities or towns, because of the need for medical care, or the attractions of urban centres. While it is reasonable to enter into public discussion about the prospects of small remote communities, any suggestion that this is a simple choice for residents, is offensive. It also shows ignorance of history, both recent and more distant. Policy makers and governments have repeatedly instituted arbitrary measures to control the indigenous population, often treating them as an inconvenience. The Australian colonial project caused severe dislocation, pushing large numbers of people off their lands; missions and reserves were established on which Aboriginal people were placed, willy-nilly; many towns did not permit Aboriginal people to reside in them. This was the state of things for many decades. There was talk, in some quarters in the 1970s, that remote Aboriginal reserves were unviable and that people should be moved into towns. To my knowledge, this proposition was never put to the people concerned. In any case, the idea did not survive. In the 1970s and 1980s, in a climate of greater recognition of human rights, including rights to land, some Aboriginal people took initiatives to establish ‘outstations’ or ‘homeland communities’. These places allowed people to leave large reserves and missions, where disparate groups were often thrown together in institutional settings that led to conflict and dysfunction. At the time, such moves were often hailed as a solution to a variety of ills plaguing Aboriginal populations. Governments encouraged the trend, and provided services to those small settlements, some of which grew and thrived while others were abandoned or used as temporary or occasional camps. Many people living in remote communities today, or their parents and grandparents, have been pioneers in making remote, small, often extended-kin-based, communities viable. This latest decision by governments to withdraw support is a disservice to those who have stayed on, or returned to, their ancestral lands. It is disrespectful in that the decisions have been taken unilaterally. Premier Barnett at least showed a modicum of sensitivity in acknowledging that the decision would be distressing to those affected. The Prime Minister, who claims to know Indigenous people well and to care greatly for them, does not show even that level of awareness. Faced with deserved criticism, he chose to repeat his assertion of ‘lifestyle choice’. 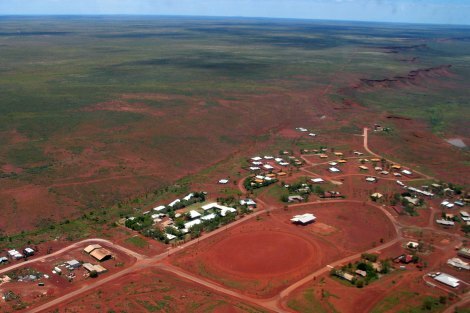 Undeniably, sustaining remote communities is expensive, and, if Mr Barnett’s numbers are accurate, the long-term viability of some of the smaller ones is dubious. For example, effective schooling is not feasible. Also, especially given the gap in health, medical services cannot be reliably provided in tiny communities. What is required is not arbitrary decision-making or implicit disparagement of people in remote communities, but genuine extensive engagement, by all levels of government, in respectful dialogue with the people most affected with a view to arriving at effective and lasting solutions. Dr Myrna Tonkinson is an honourary research fellow in anthropology in the School of Social and Cultural Studies at the University of Western Australia. She has done research among Aboriginal people in the Western Desert of WA since 1974. WA remote community image from Wikimedia Commons. As one who has worked with remote Aboriginal people for over 40 years, I strongly endorse what Myrna is saying here. The PM's remarks, though, seem to reflect a deeply engrained idea among the wider Australian polity that 'çlosing the gap' can only be done by return to the grossly assimilationist policies of the past. They did not work then and they will not work now. In all their diversity, Aboriginal people want to remain Aboriginal, They do not want to be second class whites. The challenge for policy is to take this as a starting point, then to provide practical services that 'çlose the gap' in ways that Aboriginal people find relevant to their circumstances. It is not a hopeless task. Much has been done, by many valiant teachers, doctors, nurses and other profesionals towards this end and it has WORKED. As Noel Pearson and others said yesterday, pulling the rug out from such patient work, in radical 'top down' ideological assimilationist policy, will not. It will only further punish an already destitute first nation. Hi Myrna, I agree with nearly everything you write, except " (More recently, following sustained criticism from many Aboriginal and other quarters, he argued that closure was a way to address violence and child abuse.)". Colin Barnett was saying that right from the beginning: you can read in The Australian, 13th Nov 2014, that he said of some communities: "They cannot provide education, they cannot provide health, they cannot provide employment ... they are not viable and the social outcomes and the abuse and neglect of young children is a disgrace for this state". This whole thing has been terribly handled but we have to look at what people say and acknowledge that they may mean what they say .... and then work from there. On another note, if we're going to have a conversation about sustainability of small communities in regional and rural Australia, lets broaden the scope to include those communities that will be hammered, are being hammered now, by climate change. How long are we prepared to support communities exist while they will become economic and social basket cases due to climate related issues impacting on farms and cattle properties? Already several communities in western and rural Queensland could arguably be costing us tax payers a fortune keeping them alive with services. if we're using economics as the sole measure, then I suspect a lot of small towns already are running at a loss. There does not seem any angst in the nation's capital on this issue. Thank you Dr Tonkinson. Your article said succinctly, clearly and authoritatively what I wish I had been able to say when I heard the PM's statement of principle that government 'cannot endlessly subsidise lifestyle choices'. Why pick on indigenous people to put this principle to the test? Why not politicians? I have worked as a doctor with aboriginal people in WA and in the Torres Strait. I went hunting crocodiles and deer with aboriginals and learnt much from them. I was stunned at their understanding of basic science observed from Nature, such as the understanding of parallax error employed in spearing fish, something they laughingly tried to teach me and I simply couldn't master. I sat at the prow of a launch travelling across the most dangerous shipping waters in the world in the Torres Strait in the dead of night with the aboriginal navigator. He sat shining a torch on the surface of the sea and guiding the captain with hand signals. He was gauging the depth of the water by the size of the surface swells and ripples - the deeper the ripples the deeper the water. We didn't hit anything that night. They taught me how to get water from freshly cut vegetation with an ingenious method based on evaporation. In WA I removed a spear head from an aboriginal youth who had been ritually punished for some transgression or other by spearing. I amputated an old man's leg which had been paralysed by a stroke. He believed he had a snake in his leg so stuck it in a fire to get rid of the snake and damaged his leg beyond repair. Fortunately the stroke had also affected the feeling in his leg and the pain was not too unbearable. I stood helpless and watched an aboriginal man dying because he refused to eat or drink believing that Satan was inside him after he was raped by a strong young buck when he was sleeping. I saw a 4 year old little girl die of septicaemia, brought to hospital by her parents who then ran away after three or four days of witch doctor medicine, with cuts on her chest and her abdomen wrapped in vines. I certified death by drowning in a toddler abandoned by her parents who went on a drinking spree leaving her to wander around unsupervised until she fell into a dam. I agree with the prime minister that the services the taxpayer provides must be for the benefit of the aboriginal people and that the taxpayer should not subsidise a lifestyle that is characterised by great disadvantage, ill-health, lack of education, drunkenness and abuse of women and children, both physical and sexual. If that service can't reasonably be provided with success in remote areas then it should be provided in another location where the aboriginal people will benefit. The alternative is to live the genuine remote life that I describe above with all its human disaster. Time to stop the hand wringing, false compassion or whatever it is, and think of the human beings who suffer and happen to be our remarkable aboriginal brothers when they are at their best. Unfortunately the PM not only has no appreciation of the depth of Aboriginal culture, he is also teaching his shallow notion of 'lifestyle choice' to other people who will now share his ignorance. Thank you Myrna; an excellent article which as I understand it is appealing for a more rational and respectful conversation with those involved rather than the usual Abbott sound grab. However, something important could be happening here, and John Frawley seems to have it right: remote communities need to decide if they are going to return to an essentially "authentic" traditional hunter-gatherer way of life (NOT "life-style" which is quite patronising) or move to where government support can be given...and that has to improve immeasurably in engagement, empowerment and effectiveness where it is provided! Fundamental honesty about what people want and what can be achieved is essential in a new non-PC "grown up" Australian conversation. John Frawley, your frustration and anger are palpable and understandable, to a degree. However, selectively cataloguing some of the egregious occurrences in remote communities does injustice to their complex and varied conditions. It also fails to acknowledge that the people concerned have views that should be heard. The beliefs and practices you have selected to recount won't just go away if people are unwillingly dragged into large settlements, cities and towns. Australian taxpayers 'subsidise' many things and people of which/whom they disapprove. We must get beyond that simplistic approach to problem-solving. By the way, I thought terms like 'young buck', were no longer used to label human beings, however despicable their crimes. Dear Myrna, Yours and my understanding of the English language are clearly miles apart. I find no "frustration and anger " in anything I have written here. While I may have highlighted some of the enormous human disasters associated with my experience of my fellow human beings' "egregious' (i.e. "shocking") experiences, such is not "selective" within an otherwise blemish free system of living. In fact, I think it is abundantly more clear from what I have written that I am an admirer of the Australian aboriginal people and feel for their plight. I would have though that for the genuine aborigine the imposition of European society on their way of life by enforcing their culture, medicine, justice systems, religion, language and lifestyle on the aboriginal people would be a cause of genuine distress. I would have thought that the genuine aboriginal people would prefer to live without such impositions. I would have thought that the aboriginal people would prefer like any other parent to be responsible for their own children, would prefer to cherish the women who bore those children and would prefer to accept responsibility for their own. Clearly, probably because of the abject failure of government and white society to provide a society of independence in the aboriginal people, preferring to impose Victorian English welfare for the "inferior savages" in the cause of Christian civilisation, I concede that it is probably now too late to abandon financial and educational support for the aboriginal people to survive in this modern world. After all, many non-aboriginal people fail to survive in this same environment. The aboriginal people need to grasp the challenge and care for themselves, take rather than squander the advantages that befall them in this society to the betterment of their society and develop some pride in such achievement. If the government, aid agencies and Christian do-gooders removed all subsidies in terms of health, education and financial viability the aboriginal people would become extinct in the remote areas very smartly indeed. It is time to stop the rhetoric and for the aboriginal people to become proactive in a meaningful rather than a political way. Incidentally, the term "buck" is not derogatory nor racist in the English language. Perhaps you might prefer, "young colt". After all, most of the great aboriginal footballers (a game at which aborigines excel) have played for the "colts" team in their clubs as young men. Time to think of the aboriginal people and to hell with the politics!!!! These remarks by Archbishop Bernadito Auza, the Permanent Observer of the Holy See at the UN, on 20 October 2014 are useful for those Australians seeking a more considered discussion about the place of Indigenous Australians in the life of the nation following upon Prime Minister Tony Abbott’s remarks about ‘lifestyle choices’: Fostering indigenous specificity and cultures does not necessarily mean going back to the past; indeed, it entails the right of indigenous peoples to go forward, guided by their time-honored collective values, such as respect for human life and dignity, representative decision-making processes and preservation of community rituals. In the face of globalization, industrialization and urbanization these values must not be simply put aside. In this context, my delegation wishes to underline the following principles: •	The world's indigenous peoples have the same claim as every person, people or nation to their fundamental human rights to development; •	The realization of their right to development must be as much as possible coherent and harmonious with their specific identity and values; •	The indigenous peoples themselves must have a say on their own development. In this sense, one should refrain from implementing criteria or setting policies alien or unacceptable to those concerned. Policies formulated for indigenous peoples without their active participation in the decision-making process could do more harm than good, especially if they do not reflect or respect their identity and value system. The temptation to refer to them merely or primarily for folkloric effect must be resisted. Their input in the decision-making process is vital, because the very survival of their identity and heritage could be at stake. See http://www.holyseemission.org/statements/statement.aspx?id=509. Annabel Crabb chaired it all really well, but the next day I realised that not only our Foreign Minister, but not one panelist, got one question about their extraordinary achievements. Bishop was managing partner of a big law firm. She has unique experiences and must have views on the world’s problems and their impact on Australia. But nobody asked.